Suede Stone 20 years in the business! Located in Co. Limerick, Suede Stone is a boutique natural stone provider with the emphasis firmly on customer service and product quality. With fewer overheads than a large showroom, our customers are guaranteed a competitive price that does not compromise on quality or finish. SuedeStone are specialists in bespoke cut stone items including, marble stairs, cut stone entrance piers, vanity units, fireplaces, bath surrounds, stone skirting, window boards, water-jet cut stone flooring, mosaics etc. We are also stockists of a wide range of natural stone tiles including marble, travertine, limestone, and mosaics for floors and walls, for commercial and residential use. Please telephone for an appointment to view our showroom or to book a site visit. There are numerous advantages to using natural stone such as marble or granite in place of synthetic materials such as porcelain, concrete or ceramic tile. Natural stone is durable, long-lasting and the colour selection is generally far more extensive. Most people consider natural stone more expensive than it actually is. Not only can natural stone be affordable but its resilience proves cost effective over time. On the other hand, synthetic material requires periodic replacement and costly repairs. 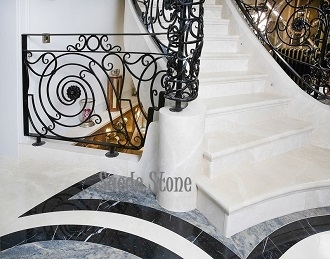 At “Suede Stone”, we pride ourselves on the ability to offer quality marble, travertine and limestone at affordable prices that are often lower than those of synthetic products. We are a family run business who will provide you with a highly professional and personal service. We can help you design your project and help you with the fitting also. We offer bespoke items such as cut stone piers, stone stairs, water-jet cut stone flooring, mosaic flooring and paneling, vanity units, window boards etc. Please telephone for an appointment. Our showroom is at Kildromin, Kilteely, Co. Limerick. We are open 7 days a week by prior appointment.